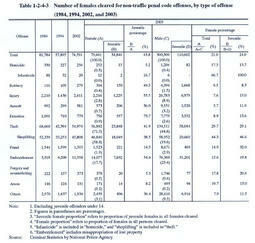 White paper on crime 2004 Part1/Chapter2/Section4/1. Fig. 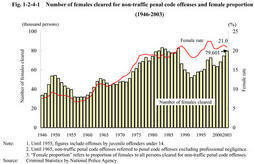 1-2-4-1 shows the number of females cleared and female proportion of all persons cleared for non-traffic penal code offenses since1946.Females cleared for non-traffic penal code offenses started to decline at the beginning of the Heisei period(1989),after peaking in1950,1964,and1983.Having bottomed out in1992at about52,000,they then increased again by5,010from2002to79,601in2003.Female proportion,which had showed a rising trend since1946,surpassed20%in1988and has fluctuated around20%since then.In2003,it decreased by0.4points from2002to21.0%.Female cleared rate per100,000population aged14or over for non-traffic penal code offenses was between100and130since1989,and was139.2in2003,up8.3from2002(see Appendix1-1 ). Fig. 1-2-4-2 shows the age distribution of females cleared for non-traffic penal code offenses over the last10years.Juveniles have accounted for the largest share;juvenile percentage in all females cleared was43.8%in2003,the lowest level since1981.Among adults,the share of those in their20's to50's has declined or remained flat whereas share of those aged60or over has been on the rise,and those in their70's showed a significant increase in particular. Table 1-2-4-3 shows the number of females cleared for non-traffic penal code offenses in2003,by type of offense,compared with1984,1994,and2002.In2003,females cleared for theft accounted for the majority at71.5%,followed by embezzlement and injury.More specifically,approximately80%of those cleared for theft committed shoplifting and most of those cleared for embezzlement committed misappropriation of lost property.The female proportion in all persons cleared was high for infanticide in homicide(66.7%)and shoplifting in theft(44.3%). The juvenile proportion in all females cleared for non-traffic penal code offenses was extremely high for such heinous and violent offenses as extortion(73.7%),injury(55.5%),and robbery(49.3%),as well as for embezzlement(54.6%).